Every other Sunday Morning from Sunday the 21st of June through till the 11th of October, growers, farmers, vendors and volunteers create a hive of activity in King City this is the place to buy luscious farm fresh produce, fresh bread, honey, meats, maple syrup, cheeses, eggs, home-made baking, hand-made crafts and a great place to meet up with friends over breakfast or lunch. On June 21st we are offering free pea meal on a bun to all of the dad’s to help them celebrate father’s day- don’t miss yours!! Founded in 2012 by a dedicated group of volunteers from the community, who noticed an opportunity in King City to provide a venue for a chat, an opportunity to buy and taste local produce and to support our growers and vendors who make the market a special place for all to enjoy. King City Farmers market is starting its third growing season this year; we average 12 + growers and 10+ vendors who frequent the Sunday morning sales, as the growing season progresses. Each week nature’s bounty will be on display for the discerning shoppers. We are always looking for new non conflicting growers and vendors to enhance our scope. Please contact Mike if you need more information. For the 2015 season we are featuring “Theme” days such as “Pumpkin Celebration day”, Wine and Cheese tasting day”, in conjunction with the Tawse Winery from Niagara, who will be a regular feature this year. Please come out and enjoy the different theme Sundays as the bounty of the fields comes in to the market for your enjoyment. The market success so, far is thanks to the support of the community, who come out to shop every other week. We plan to give shoppers a good reason to come out again this year, to meet old friends or new friends and to enjoy the market. This year we are looking for acoustic musicians who can add to the ambiance of the farmers market, if you are a musician and wish to donate some time, please let Mike Know. 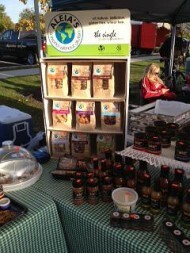 We have a regular vendor who specializes in gluten free tasty treats and more. The market growers specialize in luscious fresh farm grown fruits and veggies, which will be here as the season progresses. The King City Farmers Market committee members would like to express our sincere thanks and appreciation to our Growers, farmers and vendors, and especially our new 2015 Sponsors and donors, who help support our advertising and communication initiatives. Come on out for 2015!! Be a part of the fun. We look forward to seeing you there! !